Danny Aldridge was born in Michigan on September 13, 1956 but moved to Petaluma with his mom and brother at the age of four. In 1960 Petaluma was a very small town and many of Danny’s early activities revolved around school and working for the Parks and Recreation Department after high school. Sports were an important part of his Petaluma days, especially when he discovered an aptitude for running. While not planning to go to college after high school, his 1:49 half mile time caught the attention of several college and university track coaches. With a promise of full ride scholarship, Danny headed to USC. Dislike of Los Angles, the turmoil of the ’70’s and a promised-but-not-delivered cross country program brought him back to Petaluma and to Santa Rosa Junior College where he became the state junior college champion at the 1500. More scholarship offers poured in. A long-time friend, Stan Hockerson, suggested that Danny look at Cal Poly, a smaller school in a smaller setting. It fit him perfectly. With two more years of track eligibility and three years of cross country, he excelled in his running events and worked with coaches and teammates with whom he would establish life long friendships. At Cal Poly he won two individual national titles and helped win two national team championships. Among a long list of outstanding racing accomplishments was a 1981 race with the great Kenyan runner, Henry Rono. Danny went under 4:00 minutes for the mile – one hundredth of a second under the magic number! He also ran a 3:58.2 mile that same year. 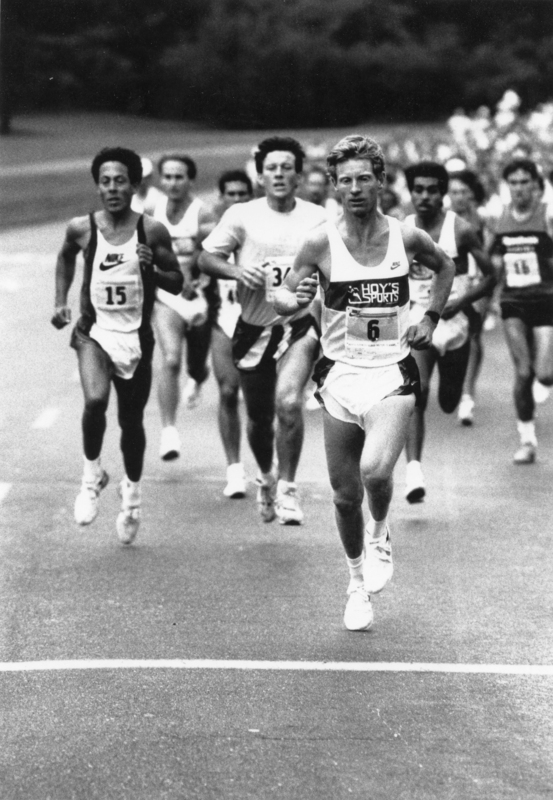 In 1981, Danny was invited to join Athletics West, a team sponsored by Nike, in Eugene, Oregon and ran as a professional for five years. Athletics West was the first organization to offer high level training and support for post-college track and field and cross county athletes. Danny raced nationally and internationally with Athletics West for four years. Following that career, he returned to Petaluma with an offer from Stan to run a speciality running shoe store, Sports Afoot. Back in the area lead to other opportunities to continue his presence in running. Again as a coach. Five years at Sonoma State in cross county and track; five years assistant coach under Doug Courtemarche with Santa Rosa High School and the Santa Rosa Express; nine years at Maria Carrillo High School; currently cross county at the Sonoma Academy. His coaching experience has lead to many memories of times spent with his athletes. The most memorable events revolve around the growth and maturity of the athletes as they gain confidence in themselves and belief in their potential. In his 50’s Danny decided to get back into running doing a sub-five minute mile as age 51. 800m – 1:49.21, age 18 – 95.1% of standard; mile- 3:59.95, age 24 – 92.75% of standard. Other impressive results include: 3:38, 1500m, 32:04, 2 mile, 28:28, 10k, 2:21.42, marathon. Danny has been a member of Empire Runners since 1990. Congratulations Danny on your outstanding success and accomplishments in racing and your dedication to coaching others to meet their potential. Steve was born March 17, 1952. Steve grew up in Massachusetts and loved sports at a young age. In high school, he played baseball (mainly 3rd base) and was a 135 pound running back on the football team for four years. 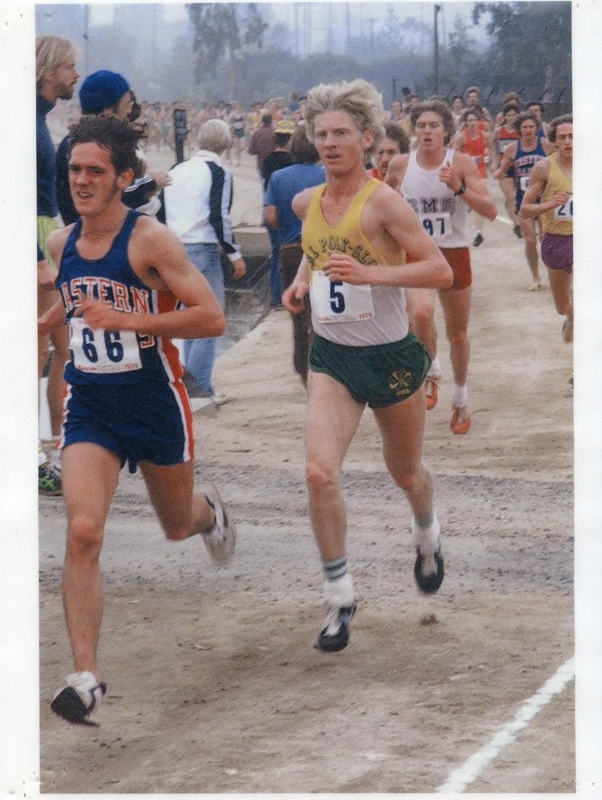 He moved to California in 1976 and started running in 1980. From then until 1984, running was his main athletic activity. Then he began riding his bike, doing a century ride a week for a year. Triathlons came next. Swimming, biking and running take a lot of time in order to compete. Family life took priority and raising three children replaced athletic competition for a while. But Steve still managed to get in two or three races a year. Steve joined a gym in 1996 and my gym friend, Harald (Potts) Nordvold, spent ten years trying to get him to join Empire Runners. During that time Steve became an avid tennis player and ran the tennis league in Rohnert Park. He also got back into baseball playing for a Sonoma County league. Finally Potts and another friend, Gil Moreno, would not take “no” for an answer any longer. He joined the club and fell in love with running again, participating in every ER race and many training runs. For the first Summer Track Series meet he attended, he ran every event. He takes inspiration from many club members and is proud to be an active part of Empire Runners. 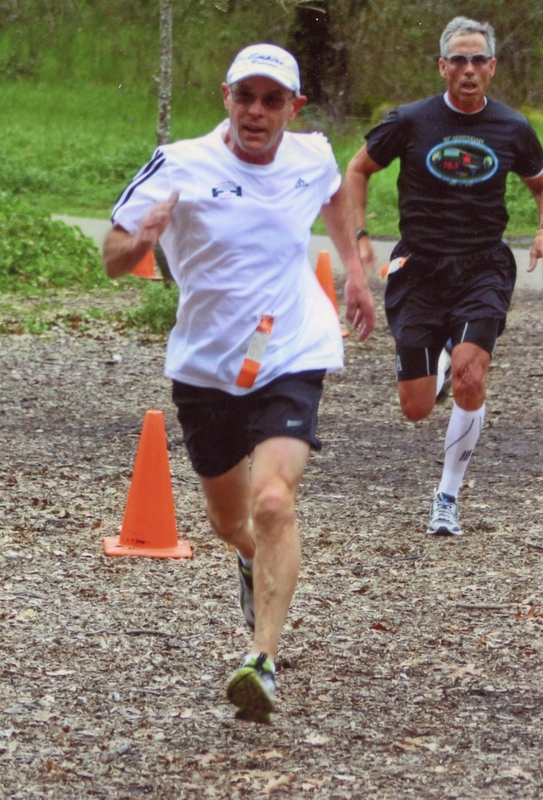 In 2013 Steve was excited to win the PA/USATF Road Racing Championship in the 60-69 age group. He runs 60 to 80 races a year while traveling all around the San Francisco Bay area. He rarely misses a weekend of running and racing. He has also travelled out-of-state for runs including three trips to Boston for their big event. Recently Double Racing has become a special interest and a new joy in his life. He has done every double in California as well as traveling to Kansas City for a race. Double racing combines two events in the same day with a short rest period in between. A 10K followed by a 5K for example. Unfortunately, Steve has been slowed a bit in the past year due to a bout with a lymphoma and the resulting chemotherapy and radiation treatment. In true running spirit, he pushed his doctor to finish treatment in time to run the 2016 Boston Marathon. It was a great accomplishment for Steve to finish the event ahead of many other Boston qualifiers. The goal for now is to get back into running shape. Maybe not 60 to 80 races a year, but to a point where running and racing can be enjoyed for many many years to come. It’s always good to have specific goals and Steve’s is to continue running Boston each year and to win his age group when he turns 70. That mark has been in his mind since he turned 60. He has several more years to work toward it. 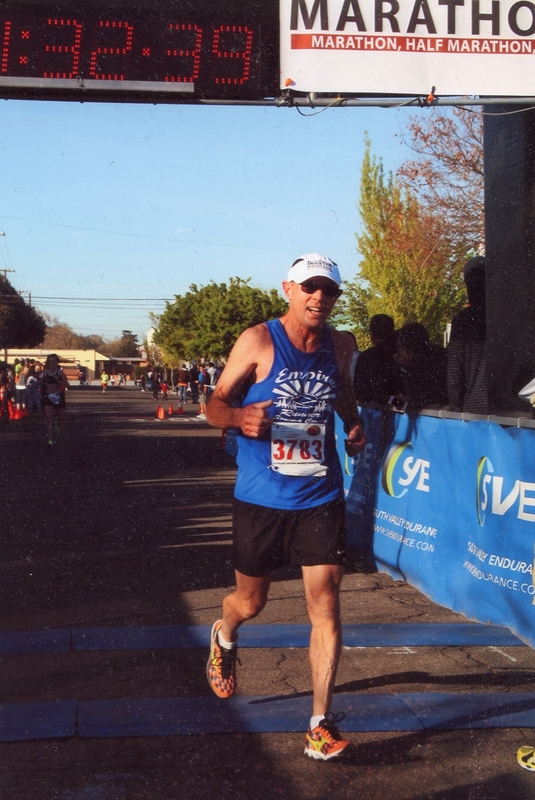 Working with the Empire Runners and seeing the result of steady practice and inspirational club members helps Steve realize his effort will pay off while he is enjoying what he loves to do. Well done and congratulations Steve on your running career and accomplishments.